I grew up eating a version of this Healthy Beef Stew on a regular basis. My Mom was actually pretty famous for her pot roast. It was, in our church circles a coveted meal. What most didn’t know, was she always made a beef stew the next day with any little bits of leftover meat and veggies. 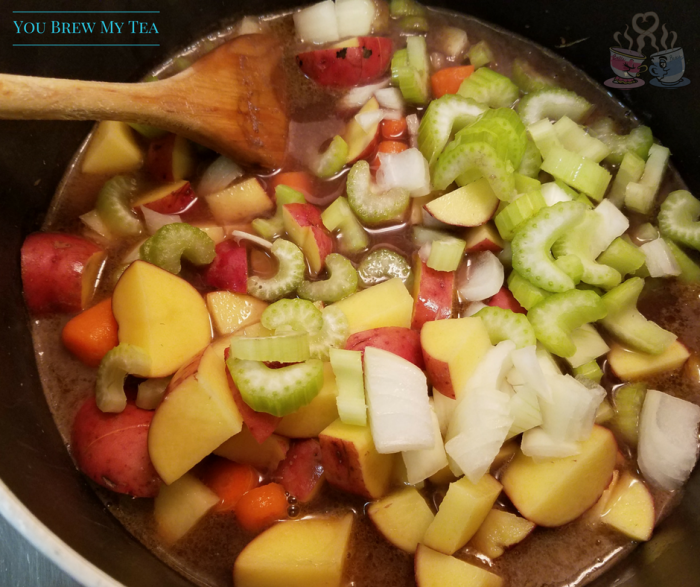 So, as I wanted a hearty Weight Watchers friendly stew recently, I took a lot of her basic tips and applied to making this yummy but healthy beef stew recipe. I am almost certain, that when I was a teen I had beef stew at least once per week. It seems like it was a staple meal in our home back then. Sadly, it has been years since I have made it. So, when I kept seeing lean cuts of beef at great prices at our local Aldi, I just couldn’t resist. I had to make this again and somehow make it healthier. 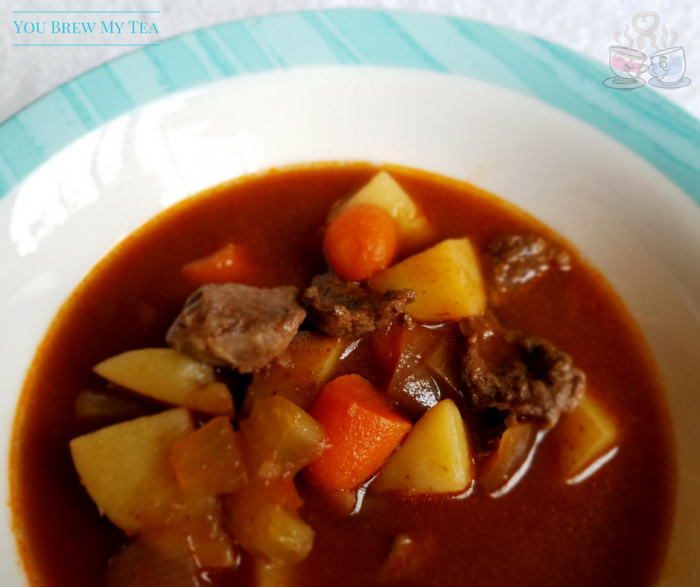 The result was a really delicious and easy to assemble healthy beef stew that we devoured. If you have a great butcher, you can ask them to give you the end pieces of the sirloin. Many meat counters will simply chop this up for stew meat anyway, so if you have a good relationship with your butcher you can ask directly. It’s a leaner cut of meat, but will still be tender in a stew. Another option is to use leftover meat you have had from preparing a traditional pot roast. My friend Savanah has a great Crockpot Pot Roast recipe that is ideal for this. If you decide to use this instead, you’ll want to make sure you measure and recalculate points for Weight Watchers. There shouldn’t be a huge difference, but it is always best to be safe. Prepare vegetables by washing and dicing into bite sized pieces. I prefer to cut my potatoes and carrots a bit chunkier than the celery and onion. This is a personal preference. 1″ chunks are average. Set these aside. Trim any excess fat from meat. Cut into 1″ chunks. Lightly season beef chunks with salt, pepper, and onion powder. In a large stockpot lightly sear seasoned beef on all sides. 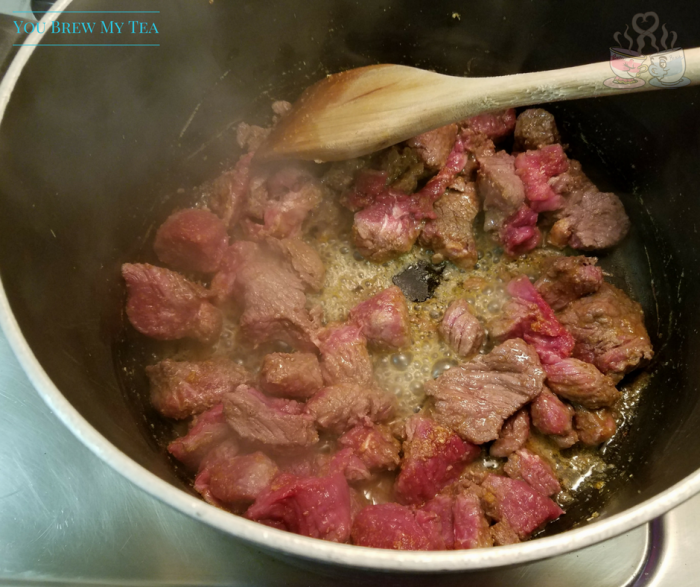 I use a non-stick pot and 1/2 cup beef broth in lieu of oil to keep the points value down. You can substitute in a bit of olive oil, just remember to add that to your points total if you do so. Once the meat has seared and is mostly cooked through (7-8 minutes cook time), add in cooking wine and beef broth. Cook on high for additional 5 minutes. Add all other ingredients to stockpot and stir well. If you want a thinner broth, you may want to add 1-2 cups of water to the mixture at this time. Simmer mixture on medium heat for 35 minutes or until vegetables are tender. Stir occasionally to prevent vegetables and meat from sticking and to help flavors meld well. Prepare vegetables by washing and dicing into bite sized pieces. 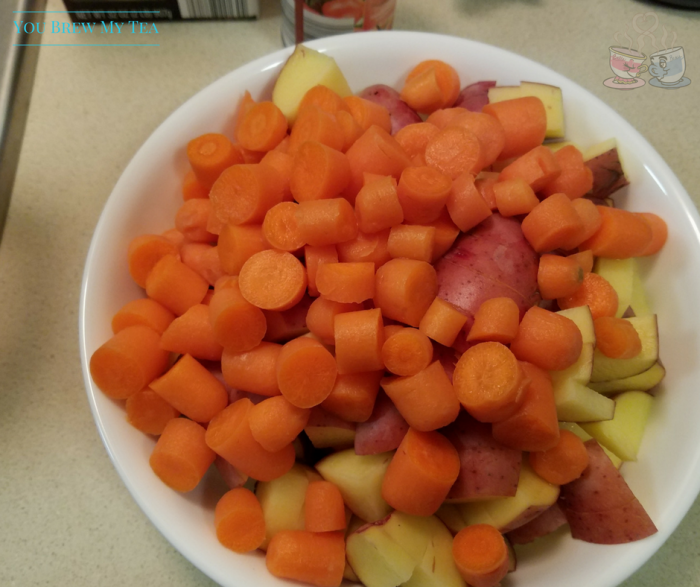 I prefer to cut my potatoes and carrots a bit chunkier than the celery and onion. This is a personal preference. 1" chunks are average. Set these aside. Trim any excess fat from meat. Cut into 1" chunks. Lightly season beef chunks with salt, pepper, and onion powder. In a large stockpot lightly sear seasoned beef on all sides. I use a non-stick pot and ½ cup beef broth in lieu of oil to keep the points value down. You can substitute in a bit of olive oil, just remember to add that to your points total if you do so. While I don’t measure the servings out with a measuring cup, I do measure out into storage containers right away. The servings are usually around the 2 cup level in my airtight storage containers. So, if you are measuring for exactness, I would say a 2 cup serving would be close to the 5 SmartPoints mark. This recipe was calculated using the Weight Watchers recipe builder. While I am not associated with Weight Watchers, nor is this post approved by them, I know that the points are accurate for the specific brands I used. To get the most accurate SmartPoints calculations, I always recommend using the on-site or in-app recipe builder with your unique ingredients. You may also be interested in using the SmartPoints Calculator you can purchase and use without access to the website. 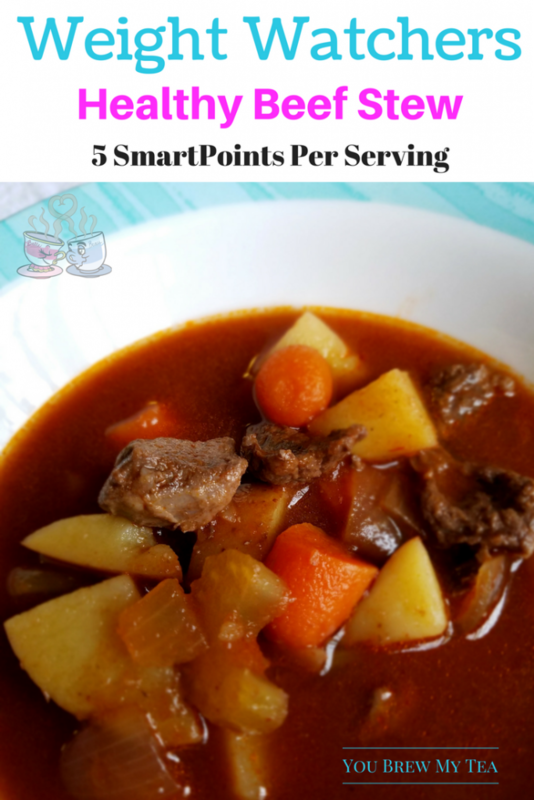 This healthy beef stew recipe is obviously a delicious and flavorful choice for any dinner. While I prefer making this on the stovetop, I can see that it would work wonderfully in a slow cooker. Simply adjust your cook time by adding all ingredients to your slow cooker at once and allowing to cook on high heat for 4 hours. Another option would be to use a dutch oven or even a pressure cooker. 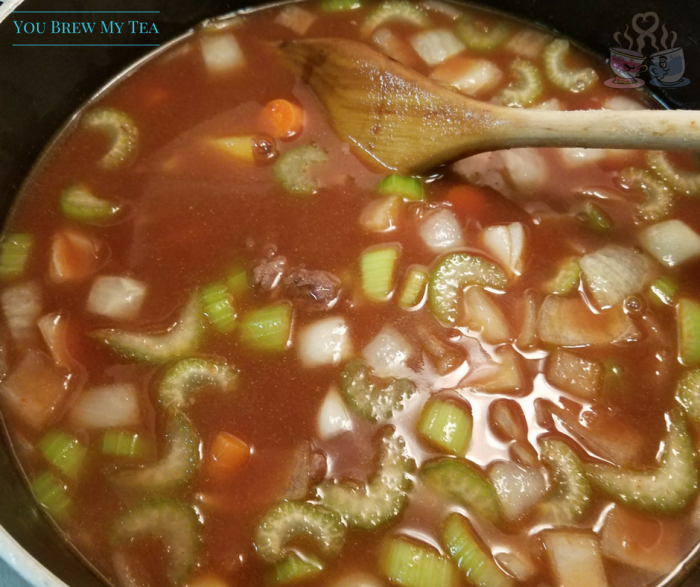 I hope you like my simple take on a Weight Watchers Healthy Beef Stew recipe. It’s so easy to make, smells wonderful while cooking, and appeals to the meat and potato fans in your home. Don’t forget to check out all of our other Weight Watchers recipes linked below. For more recipes and tips, make sure to sign up for our email newsletter! Hi! This looks wonderful! Due to a health condition cooking with anything with alcohol is off limits for me. Would you recommend just using more beef broth or would something like grape juice be a good substitute for the wine? I love your weight watchers friendly recipes!! Thanks for sharing at the What’s for Dinner party! It is cold and rainy here today and this soup looks delicious! Hope you are having a great week and thanks so much for sharing with us at Full Plate Thursday!